The Calder Memorial Trophy, awarded to “the player selected as the most proficient in his first year of competition in the National Hockey League”, has been given out every year since 1937. It’s one of the oldest awards in the league outside of the Stanley Cup proper, and boasts a laundry list of winners who have gone on to shatter records and shape entire generations of players. The league laughed when one lone writer gave their top 2018 Calder ballot choice to the 26-year-old Yanni Gourde, who was just months away from being ineligible age-wise when he put up his strong rookie season in Tampa Bay. Of course, goalies are a bit different. There are just two roster spots for the position on each NHL club, leaving less opportunity for breakout seasons at young ages. Teams live and die by their goaltenders, so there is a standard of excellence that keeps prospects out of the lineup when they still need work – diminishing their overall game start numbers and occasionally skewing their stats in a way that skaters don’t have to experience. That leaves a little bit more forgiveness for the 25-year-old Jordan Binnington, who made his official full-time NHL debut this year in his final year of Calder eligibility. And after largely carrying his team on his back in a historic leap from the very bottom of the standings to a locked playoff berth, there may be a legitimate case for him to pick up some votes in this year’s Rookie of the Year consideration. A goaltender hasn’t taken home the Calder since 2009, when a 20-year-old Steve Mason played in 61 games and blew the rest of the league out of the water. Only 15 of the 81 trophy recipients have been goaltenders, and they all played massive workloads; at most, Binnington will only be able to appear in half of Mason’s Calder season workload when the season wraps up this weekend. The league has changed, though, maximizing efficiency in an increasingly-difficult season that stretches from October to April. With just two or three games to go for each team, only five goaltenders have hit the 60-game threshold in games played, and only four more have the chance to reach that before the regular season ends. No goaltender will hit the 70-game mark this year – and of the 90 goaltenders who have made at least one NHL appearance, only 18 are even eligible to hit 50 starts. That goes to highlight just how heavily the Blues have relied on Binnington, who has started 28 games and played in 30 since mid-December. He made his first start in the team’s 40th game, appearing in all but 12 of their games from that point on. Despite the massive workload, he’s been one of the league’s most consistent goaltenders from both a numerical and technical standpoint. Of goaltenders with at least a 30-game sample size on the season, only Ben Bishop has a better Quality Start Percentage, and both he and Bishop are the only goaltenders with that sample size who have just one Really Bad Start (meaning an .850 save percentage or worse). He has a .920 save percentage in 17 of his 28 starts and a .900 or better in 21 starts so far; add in his ridiculous five shutouts in 30 games and a 79% Goals Allowed percentage relative to the league (third best among goaltenders with 30 or more games), and he’s a top-five goaltender among starters – not just rookies. Perhaps the most impressive part, of course, has been the consistency. Even the best rookies sometimes struggle to avoid slumps, but so far Binnington has looked as good late in the season as he did when he made his debut – and that’s as rare as it is difficult. His version of “highlight-reel” saves don’t involve windmills and last-second dives, but his short movements and fantastic hockey sense are just as impressive to watch as an Elias Pettersson breakaway. Take a look at this pair of saves from St. Louis’ game against Colorado on April 1st, which saw Binnington allow just two goals in regulation and overtime before stopping all three shootout attempts he faced to secure the win. This first period save saw Binnington stay comfortably within his crease, coming out to a conservative distance to cut down the angle as Matt Calvert carried the puck up the wing before barely adjusting to center himself on the angle of the pass and subsequent tip by Tyson Jost. A lot of goaltenders – including his tandem partner in Allen – would potentially overshoot the pass, leaving their short side open for the tip-in; Binnington followed the trajectory perfectly and made an easy stop without a rebound. His protection of the short side was even better displayed in the second period, when he completely sealed his low glove side to stop Tyson Barrie from scooping up a soft rebound in front. After tracking the first shot into his pads and setting his edges for a controlled drop, Binnington keeps his eyes on the rebound in the slot and superbly seals the space between his side and the post to take away Tyson Barrie’s space on the second shot. With the contention often displayed over goaltenders and their use of post integration technique these past few years, this stop was a perfect example of how some goaltenders are able to completely take away the shooting options for their opponents without adding aggressive challenges or opening up extra holes. Binnington is the league’s first rookie goaltender since 2007 to earn two consecutive Rookie of the Month honors, doing so while leading his team directly into a playoff spot. Despite the smaller sample size his numbers have to offer, the frequency with which he’s played – and the consistency he’s displayed in the process, not just numerically but visually – makes it hard not to give him consideration. Of course, it helps even more that the league’s most eye-catching rookie has a smaller sample size to offer himself. In a surprisingly underwhelming rookie class, Elias Pettersson is leading all rookies in scoring by a whopping 22 points despite missing 11 games because of injury. He stands as by far and away the best candidate for the Calder, boasting 65 points in a nice 69-game sample size so far. The next-highest scorer is Brady Tkachuk, with just 43 points in 68 games, hardly a stand-out for the trophy. Only four rookies have 20 goals, none are likely to hit the 30-goal mark, and defender Rasmus Dahlin might get overlooked on a once-again miserable Buffalo roster. There’s definitely a case to be made that Binnington’s performance would have trouble cracking the finalist list in the Calder classes of prior years, but with the offerings of this season, he’s a hard sell to leave out. It’s rare that a single player has the ability to take a team from the bottom of the standings to the postseason. When the Minnesota Wild added Devan Dubnyk in January of 2015, desperate to stop the bleeding after a six-game losing streak, they were 18-19-5 and had 41 points in 42 games. Even Andrew Hammond’s miraculous run in the spring of 2016, which saw the then-rookie put up a mind-boggling 20-1-2 record to push his team into the playoffs, had the Senators offering him 66 points in their first 63 games to work with. When Binnington was brought up for the Blues in December, the club was on life support. When he made his first relief appearance of the year for Jake Allen on December 16th, the team had 28 points in 31 games. When he made his first start on January 7, a shutout against the Philadelphia Flyers, the club had 36 points in 39 games. It was a tight race in the horrifically weak Western Conference, but the Blues looked to be all but out of it for the year. His technical precision got the team the wins, but his off-ice personality, which featured hilariously dry humor and an ice-cold confidence, gave the fanbase hope. He got the arena cheering again, engaged the fans in his own unique way, and brought St. Louis back into relevance by the time they hit the trade deadline. Instead of looking for Jack Hughes, the Blues were looking for the Stanley Cup once again. It’s tough to put stock in a goaltender’s ability to impact his team’s play, and worth noting the Blues began turning around their defensive play after head coach Mike Yeo was fired on November 20 and replaced by Craig Berube, but there’s a case to be made that Binnington’s presence and confidence also helped elevate a roster many expected more from before the season started. 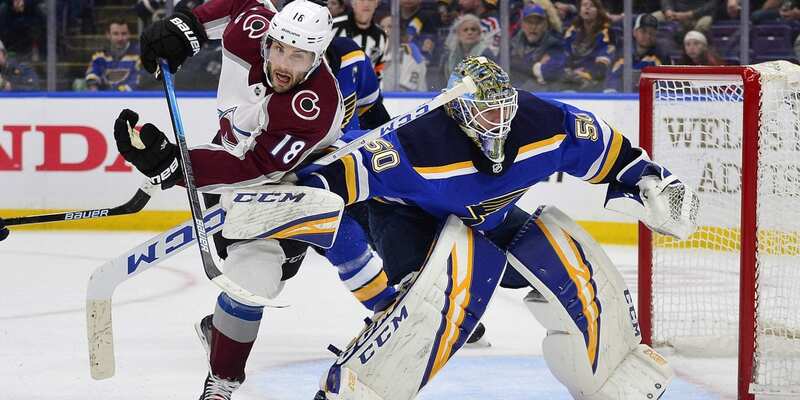 It may have even helped Jake Allen rediscover his form by shouldering some of the pressure for the beleaguered starter, and left his other teammates feeling comfortable enough with his net presence to focus on offense. With just 30 games played a few days before the end of the regular season, there isn’t enough of a body of work to consider Binnington for the Vezina. But as a Calder finalist, there’s little question; he could – and should – get a nod.